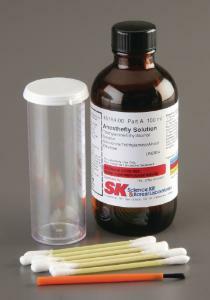 A safe, easy method to anesthetize Drosophila. Flies stay immobilized for at least 50 minutes to several hours without being killed or sterilized. Includes: 100 mL Anesthefly solution, cotton-tip swabs, sorting brush and instructions.